When the story of Jeremy Clarkson's suspension first broke, I thought, "Well, I guess that was inevitable at some point." When it later came out that it was supposedly over catering, I was puzzled. I figured it would be something more substantial. Punching someone over some food mix up seems...odd. Then, a few hours later, all three hosts took to twitter and started making jokes about it, like there was nothing at all seriously wrong. That really confused me. Who responds to a suspension by doing something that shows you don't care about it and is likely to anger your bosses even more? Why tempt fate? If the punching story is true, it's not exactly defensible behavior. Why would May and Hammond join in and risk their own careers by angering the brass as well? Something isn't adding up. The punching a producer angle has all come from unnamed "sources" so far. That's where my odd, admittedly completely baseless and speculative and highly unlikely to be true, theory comes in. What if the whole thing was a set up? What if they had something come up that required them to miss a week of taping and also required absolute secrecy? Like, perhaps, a much anticipated hypercar test? As they said last week, Top Gear is currently in final negotiations with Ferrari, McLaren, and Porsche to conduct the first ever on-track, driven in anger, head-to-head-to-head test of the three new flagship cars. The hang up, we've been told, was that each of the manufacturers was placing various demands on the test. How the cars are prepped, which track they use, which drivers are behind the wheel, the position of Earth in its orbit relative to Saturn's third moon, etc. The manufacturers all want to make sure the test and its results are as controlled as possible. It strikes me that one of the conditions could have been that nothing about the test is leaked until the manufacturers are happy and Top Gear airs the results. Presumably, Top Gear would have an interest in this as well, to avoid a scoop by other cameras and spotters in the area during their exclusive testing. So, if you are Top Gear's producers, how do you get your hosts and crew out of the studio, miss a week of taping, and not have anyone suspect that something is up? 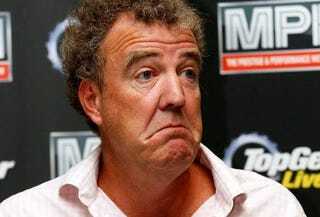 Using Clarkson's persona to manufacture a fake suspension seems like a pretty clever way to do that. He'd probably be on board with playing along, as well. Studio goes dark, none of the crew comes to work, and no one questions why. Brilliant! Of course, the other option is that Clarkson just punched a guy over some soup, which is probably still more likely than the story I just spun.